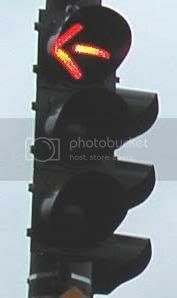 Have you ever sat at a green light, with no cars coming the other direction, and not been able to go? What do you mean, you ask? Certainly I am not that oblivious. Before you assume it's an elderly Asian woman driver that I am talking about, think about it for a bit longer and you will realize that it happens to you several times each week if you actively drive in a populated area. The situation I am speaking of is the curse of the red left turn arrow. Cars can go straight. But you are not allowed to turn left. Why? You show up to an intersection during non-peak traffic hours and no cars are coming towards you. It would be easy to make the left turn safely. But the red arrow mocks you, laughs at your plight. You are sentenced to endure a full cycle of traffic lights before it gets back to a green turn arrow. Well until the AI (that's artifical intelligence) of traffic signals is vastly improved, humans will always be able to better determine when they can and cannot safely turn left. So unless the intersection is known to be dangerous and has a blind spot, why not give a green "yield on left turn" option? People navigate 4 way and 2 way stops all the time. They make turns across lanes of traffic when pulling onto a busy road when no traffic light. So what is so hard about deciding when they can and can't turn left at an intersection? I'm tired of sitting at red turn lights when there are no cars on the horizon coming my way. I've been tempted many times to just turn anyway. But that several hundred dollar ticket for running a red light usually holds me back. Well it's time to give the freedom back to the people, and let us yield on our left turns! OK, so I totally agree with you. I hate waiting when no one is around. The yield on green with the green arrow would solve all of these problems. The only problem I can think of would be is that some people are so used to protected turns, that they would turn without thinking, but they would learn soon enough. :) I had a friend driving on the East coast that was used to always having protected left turns (she was from CA), so one time she turned and we were so close to getting in a car accident. She blamed it on not being used to unprotected left turns. In college I had a girlfriend from New Mexico. They basically only had intersections with either no protected left or left turn on green okay. Every once in a while she would forget that California is different. We would be driving along and she would "blow" a red left hand turn arrow. There was never any danger because she treated it like a left turn on green intersection, making sure it was safe. It was just a little unsettling that she would "forget". She never got caught and there was never an issue. Ohh and too be clear, she was a good driver and in no way a "dits". She just grew up driving without protected lefts. Another fun fact is she got her license at like 15 since NM used to have agricultural driving laws.